The next generation of computer and phone networks, known as 5G, is expected to connect cities around the world and fuel a future run on robots, autonomous vehicles, artificial intelligence and other technologies. But it may also rely on an infrastructure vulnerable to hackers and spies, one that the U.S. wants to stop China from building. What’s next? President Trump is expected to issue an executive order prohibiting American companies from incorporating equipment originating from China in critical telecommunications networks, extending current rules that apply only to government entities. His administration, which has also waged a trade war with China, says that it is motivated by concern for national security, not just by competitive defensiveness. China’s economic czar, Liu He, will meet with the American trade representative, Robert Lighthizer, in Washington on Wednesday for two days of trade talks, which is likely to cover issues of cyberprotection and the proliferation of state-owned companies. What do officials think? Beijing’s ambassador to the E.U. threatened “serious consequences” if Huawei and other Chinese companies were excluded from 5G projects. In Canada, Prime Minister Justin Trudeau fired the country’s ambassador to China after he said that a senior Huawei executive had “strong arguments” to fight extradition to the U.S.
And businesses? Tech manufacturers are diversifying outside China as trade tensions fester and the country’s economy slows. Foxconn and Pegatron, two Taiwanese companies that assemble iPhones, are expanding production capacity in India and Vietnam. American industrial companies with exposure to China have said that their sales there are weakening. But Apple is unlikely to bring production closer to the U.S., where manufacturers struggle to “match China’s combination of scale, skills, infrastructure and cost,” according to the NYT. The law firm Paul, Weiss is more diverse at its top ranks than most of its peers. But after the announcement of its new partner class, people across the industry began to comment that all of the faces were white, and that only one was a woman’s, the NYT’s Noam Scheiber and John Eligon write. Paul, Weiss has said that it regretted the “gender and racial imbalance” of its 2019 class. But the episode underscores how big law firms are still falling short when it comes to elevating women and people of color. Mr. Scheiber and Mr. Eligon interviewed more than 20 women and people of color who described obstacles to achieving diversity at Paul, Weiss. Many said that opportunities to be groomed for partner were harder to come by for women and minorities. “I fear that African-American partners in big law are becoming an endangered species,” said Theodore Wells, a black partner at Paul, Weiss and one of the country’s most prominent litigators. 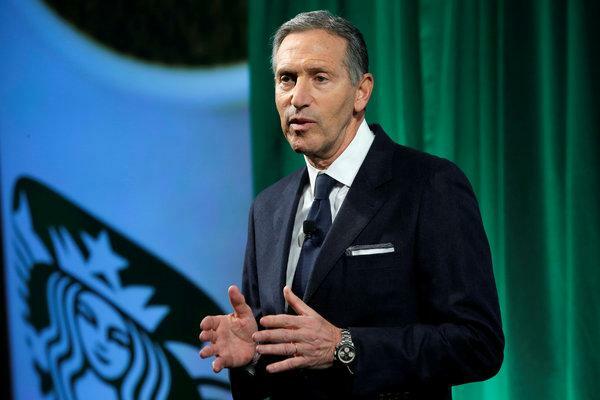 The former chief executive of Starbucks told Andrew yesterday that he was preparing to run for president in 2020 as an independent. Denouncing the “broken political system,” Mr. Schultz said he had already begun the groundwork to get on the ballot in all 50 states. Long-shot bid: Despite his considerable wealth, Mr. Schultz would face a difficult road. Few independent candidates have mounted significant challenges for the White House. Swift response: The announcement was condemned by top Democratic operatives, who said they were worried that Mr. Schultz would split votes in a general election. As Lyft’s I.P.O. nears, pressure grows on its C.E.O. Logan Green, the chief executive of Lyft, is known to be reserved, usually letting his second-in-command speak for their ride-sharing service. But now, he’s in a race with Uber to take the companies public, write the NYT’s Mike Isaac and Kate Conger. The back story: Both Lyft and Uber have filed regulatory papers to list their shares on the stock market in the coming months. The offerings are likely to create a bonanza in Silicon Valley. Why it matters: Lyft, which was last privately valued at $15.1 billion, is tiny compared with its rival and could be overshadowed if Uber debuts first. Uber could go public at a $120 billion valuation. Stocks sank at the end of last year on fears of an imminent recession, but those concerns have largely abated, with global markets now rallying at the fastest pace in months. But investors are still cautious ahead of a busy week. The next few days bring an onslaught of quarterly earnings reports from the likes of Amazon, Apple, Facebook, Microsoft and Tesla — many of which are considered to be representative of the broader economy. The Federal Reserve is also holding policy meetings this week, which come after central banks in Europe and Japan sounded cautious notes. And on Friday, the monthly U.S. jobs report will be released. What the last few months have made clear is that the forces that have held back the global economy for the last 11 years are not temporary, and have not gone away. And that, in turn, makes the world uncommonly vulnerable to a bout of bad luck or bad policy. The work force is still aging. Productivity growth remains weak, as is consumer demand. Low interest rates could constrain central bankers trying to engineer an escape from a downturn. And a “nasty feedback loop” could result in more political dysfunction, leading to risks of economic disruption like the type posed by the recent government shutdown. Speaking of which: After a 35-day stalemate, the government is open again, much to the chagrin of some of President Trump’s conservative supporters. The 116th Congress will consider Democratic wage proposals in the house and a Middle East policy bill in the Senate. Lawmakers may also consider whether to ban future shutdowns entirely. Hundreds of thousands of federal employees heading back to work should receive back pay by the end of the week. Thanks for reading! We’ll see you on Tuesday.